TORONTO, March 19, 2019 – Welcome to the 11th edition of the weekly Woodbine Snowbirds Report, now in its eighth year, chronicling the winter adventures of Woodbine-based trainers and jockeys currently plying their trade south of the border. This week, we check in with trainer Mike Keogh, who has his 21-horse stable at Aiken Training Track in Aiken, South Carolina for the winter. Keogh said the weather in Aiken has been a bit cooler than in years past, but training is going well. While Keogh doesn’t get his horses to the races during the winter, this past weekend gave him an opportunity to get some racing experience for a couple of his horses with the Aiken Trials. Held annually at the training track, the trials give the track the opportunity to fundraise to help maintain operations. This year, Keogh recorded a couple of winners at the trials on March 16, as Silver Sheriff won the feature race of the day, the City of Aiken Trophy, and Roansmoke won the Coward Trophy. Gustav Schickedanz is the listed owner and breeder of both horses, and owns Silver Sheriff in partnership with Don Howard. 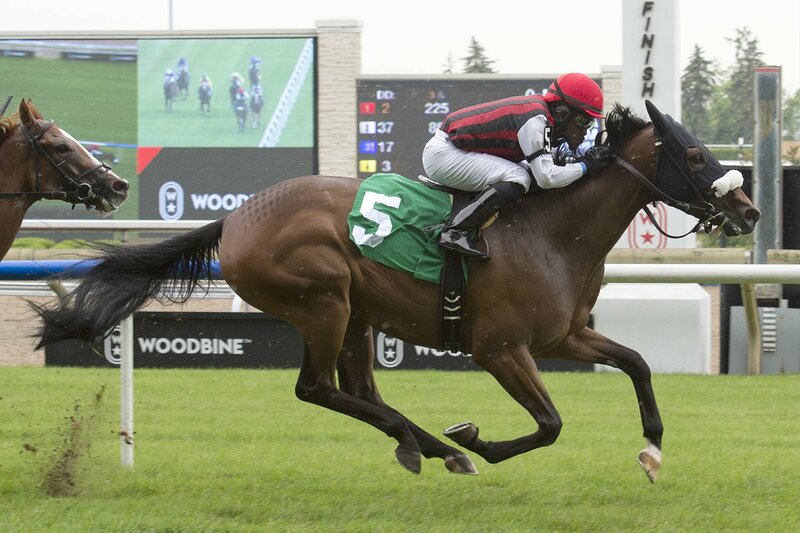 Keogh has three horses nominated to the Canadian classic races this summer, including Just Like Larry and Mr. Diffley for the Queen’s Plate, and Appella for the Woodbine Oaks Presented by Budweiser. While Mr. Diffley is unraced and unlikely to make the Plate at this point, Keogh’s other candidate, Just Like Larry, had shown some ability last season despite not reaching the winner’s circle, finishing in-the-money in all four of his starts. Just Like Larry finished second in his second start on August 24, a seven-furlong sprint on the turf, where he finished ahead of current Kentucky Derby prospect War of Will. War of Will is the morning line favourite for this weekend’s Grade 2 Louisiana Derby at Fair Grounds. Just Like Larry has resumed his training at Aiken, breezing four furlongs on dirt in 51.10 seconds on March 13. Keogh said he’s been pleased with Just Like Larry’s development over the winter. Appella also appears to be another promising three-year-old for Keogh and Schickedanz. After running second on turf against males in her debut in July last season, Appella then finished third to Sovereign Award finalist Tiz Breathtaking in the Shady Well Stakes on August 4. Following that start, she finished sixth in a maiden event at the end of August, but suffered an injury in that race and missed the rest of the season. Keogh said he would remain at the Aiken Training Center for a couple more weeks before shipping the stable back to Woodbine during the first week of April. With the new Woodbine inner turf course set to open this season, Keogh said he had a couple of horses in his stable who he thought might fit that program nicely. Three Woodbine trainers made trips to the winner’s circle last week, led by Norm McKnight, who recorded a pair of wins at Oaklawn Park on March 14 from Paxos and Redeal. McKnight saw five of his seven starters hit the board last week, including Golden Bullet (3rd, March 14), Honduras (2nd, March 15) and Adios Muchacho (2nd, March 17). Michael McDonald sent out Major Kelly to a victory at Gulfstream Park on March 15. McDonald also saddled King Kingo to a fourth-place finish on March 16. John Simms recorded a win with Josie’s Riddle at Tampa Bay Downs on March 13. Simms also sent out Stormy Leo to a ninth-place finish at Tampa Bay Downs on March 15. Two Woodbine jockeys rode winners last week, including Luis Contreras, who recorded four wins at Sunland Park. Winners from Contreras included Livin On Prayer (March 12), Thirsty Kitty (March 12), Merlin’s Jewel (March 16), and Bully Ride (March 17). Contreras also recorded four runner-up finishes and one third-place finish from 15 starters last week. Ademar Santos rode Josie’s Riddle to victory for Simms at Tampa Bay Downs on March 13. Josie’s Riddle was one of four winners for Santos last week, who also won with Faction Cat on March 16, Sassy Miss on March 16 and Malkia on March 17. In all, Santos recorded four wins from 16 starts last week, with one runner-up finish and two third-place finishes. Chantal Sutherland recorded three in-the-money finishes from 17 starts at Fair Grounds last week. Sutherland recorded a runner-up finish with Kentucky Steal during the March 13 card, and recorded a pair of third-place finishes with Glance and Swifty Cat during the March 14 card. Gary Boulanger recorded a runner-up finish with Hard Count at Tampa Bay Downs on March 13. Boulanger also rode G Friday to a seventh-place finish on March 17. Rafael Hernandez had 10 mounts at Gulfstream Park last week, recording a pair of fourth-place finishes with Rate of Return (March 13) and Monaco Princess (March 15). Here’s a look at how the other Woodbine trainers fared last week, in alphabetical order, starting with Sid Attard, who sent out Atypical to a ninth-place finish at Gulfstream Park on March 16. Roger Attfield recorded a pair of starts at Tampa Bay Downs last week, sending out Saba to a 10th-place finish on March 13 and Secret Path to an eighth-place finish on March 16. Mark Casse sent out eight starters between Gulfstream Park and Oaklawn Park last week, with three of those horses recording in-the-money finishes. That group was highlighted by Eclipse award winner Shamrock Rose, who finished third in the Grade 2 Azeri Stakes at Oaklawn Park on March 16. Other in-the-money finishes for the Casse stable last week included Sly Beauty and For Reef’s Sake, who both finished third at Gulfstream Park on March 14. Steven Chircop recorded an in-the-money finish from three starters at Penn National last week, as Speightstown Time finished third on March 14. Chircop also sent out Meet You At Home (4th, March 15) and J M R Victory Lap (5th, March 15) last week. Nick Gonzalez recorded a pair of runner-up finishes at Gulfstream Park last week, as Diddley and Littleroughjustice both finished second during the March 16 card. Rachel Halden sent out a pair of starters at Gulfstream Park last week, including Western Trouble (5th, March 13) and Canary Song (8th, March 16). John Mattine recorded four starts at Gulfstream Park last week, with a pair of those starters hitting the board. Mattine sent out Rock You to a runner-up finish on March 16, while Calais Cove finished third on March 13. Mattine also saddled Caspian Jewel (4th, March 14) and Vaughan (8th, March 15) last week. Uncle Shaggy finished fifth at Laurel Park on March 16 for Justin Nixon. Stuart Simon sent out Dragon Bay to an eighth-place finish at Gulfstream Park on March 14. William Tharrenos recorded three starts at Gulfstream Park last week, sending out Farfalla (5th, March 14), Dexter Road (4th, March 14), and Bee Keeper (9th, March 14). This entry was posted in Woodbine News and tagged 2019 Queen's Plate, Ademar Santos, Appella, Horse Racing, Just Like Larry, Luis Contreras, Mike Keogh, Mr. Diffley, Norm McKnight, Snowbirds Report, Woodbine. Bookmark the permalink.